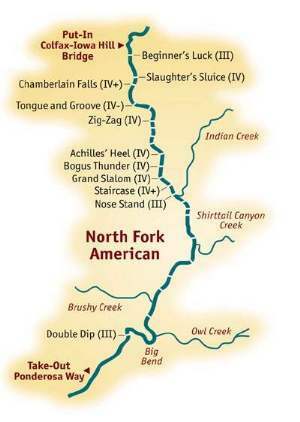 The North Fork of the American River is by far the most difficult of the three forks. 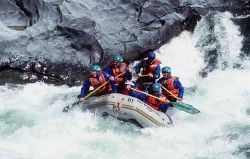 Technical whitewater rafting and kayaking skills are required for a safe and successful run. At high water, 3000 cfs and up, the river is more continuous with less time to prepare between rapids. At Lower flows (1500 cfs and below) the river is a boulder choked canyon with many rock sieves and numerous strainers. This Class IV-V, spring run starts at Iowa Hill Bridge and runs 9.5 miles down to Ponderosa Bridge at average of 36 feet per mile. A quarter mile below the Iowa Hill Bridge starts the Chamberlain Falls Gorge. Staircase rapid is one of the more infamous rapids on this North Fork American River. Following close behind are Bogus Thunder and Chamberlain Falls. Wraps and Flips are common occurrences while rafting this river. Extreme caution should be taken when running this river below 1000 cfs. If you ever have any doubts about running this river...contact a commercial rafting company.